Caique Mariagiovanna Italy Comfort Class Boat The Mariagiovanna is a caique, a traditional Turkish vessel built with mahogany wood. It has all the functionality of a modern boat but the antique charm of an “ancient vessel”. Caprice France Comfort Class Boat The Caprice is a beautiful Dutch boat that has been in operation since 2009. Its freshly varnished wood and bright colors will welcome you. The large sun deck is inviting from where there can be nothing better than to sit comfortably while cruising the canals of France. Clair de Lune France Standard Class Boat In May 2014, Marco Pouw and his wife Astrid assumed ownership of the ship Clair de Lune. 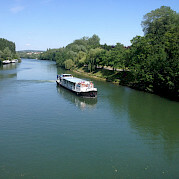 Originally built in 1936 as a freight ship in Belgium, like many of the vessels now used for biking and boating, this vessel was renovated and equipped for a new bike and boat adventure in and around Paris, launching in the spring of 2015. Marco has years of experience as a skipper on freighters in the Netherlands, Belgium, and Germany and approaches his new venture with great enthusiasm. De Amsterdam Netherlands Deluxe Class Boat The De Amsterdam, the former Lale Andersen, was built in 1991 but recently refurbished in 2017 and boasts both style and comfort. All 56 cabins on board are comfortably furnished and equipped with en-suite shower facilities, satellite TV, a safe, hairdryers, in-house telephone, and individually controlled air conditioning. De Holland Netherlands Deluxe Class Boat The former Angela Esmee, renamed now to De Holland, and was completely renovated in winter 2017/2018. 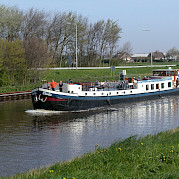 The De Holland has 34 well equipped staterooms for a maximum of 71 passengers. 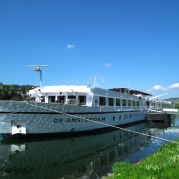 De Nassau Netherlands Deluxe Class Boat Comfort Plus class boats are very nicely furnished 5-star ships containing cabins with low beds, private bathrooms, a large dining area, separate saloon, and more. 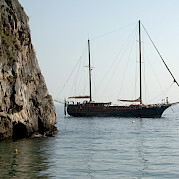 Deriya Deniz Italy Premium Class Boat Deriya Derniz is a solidly built gulet, finished with precious mahogany woods. Great care was taken in designing the interiors and external areas to provide charm and comfort. All cabins have complete bathrooms with separate showers and 1/4 tub, air conditioning with independent regulation, and portholes that can be opened to enjoy the sea and air. There is a spacious dinette with bar on board. Guests can also take advantage of a large solarium complete with beach mattresses to relax, lounge and take in the sun and sea. There is a covered back deck as well with a table for breakfasts and dinners. Elara 1 Turkey Deluxe Class Boat The Elara 1 (formerly the Halis Temel), a comfort plus vessel, is the perfect setting for your bike and boat tour in Turkey. Elizabeth Netherlands Standard Class Boat The impressive clipper ELIZABETH was built in 1913 and boasts a plush interior design. The vessel is equipped with 10 roomy guest cabins all with an en-suite shower and lavatory. The large salon features a bar and seating area to ensure you will feel right at home.